Temperature control is one of the most important features for a vaporizer to have. 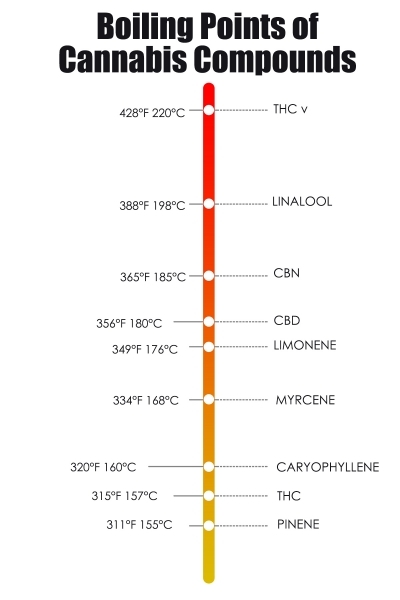 As you can see from the chart below, different Cannabinoids and Terpenes vaporize at different temperatures which allow you quite a lot of control in your pain management and functionality. Different Medicinal Effects from Different Vapor Temperatures. 310°F to 330°F – vaping at these relatively low temperatures is likely to promote some pain relief while also keeping any euphoria to acceptable levels for daytime use. As you can see from the chart the vapour will be terpene rich too. It’s also likely to create a more focused and creative buzz which could improve your productivity with some mild relaxation. 330°F to 370°F – these temperatures are recommended for a more balanced medicinal effect. You are likely to be ramping up the euphoria as well as pain relief but perhaps to the detriment of some of the functionality you would experience at lower temperatures. The relaxing effects are likely to be more pronounced and you will likely also experience some mood elevation and may even get a dose of the giggles. 370°F to 430°F – this temperature range is likely to provide you with excellent pain relief and relaxation as well as a more body stone feeling. It’s person dependant but this is more than range where most people get what is referred to as ‘’couch lock’’ where the level of relaxation is so strong it becomes difficult to do any physical activities. These temperatures could be very useful for your night time routine and should help you to easily fall asleep. It makes a lot of sense to start the day with lower temperatures and increase it throughout the day building up to the highest temperatures before bed time.